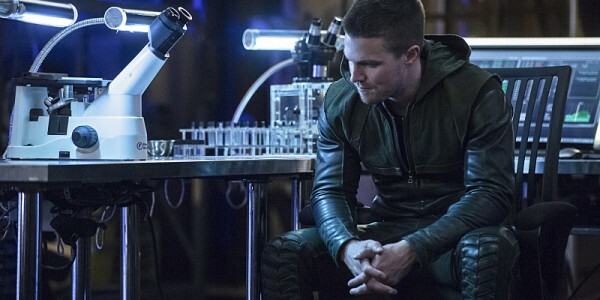 "Strong Character Piece Supercedes Weak Villain of the Week"
In "Sara," Arrow handles the death of a major character in a way that so rarely happens on superhero or genre shows: the series actually allows the characters to spend an entire episode processing the devastating loss. Far too often, when a character is killed on a genre show (or, really, most television shows), the characters spend a brief period within the following episode discussing the death and then move on to either exact revenge or simply begin to go on with their lives. In most cases, after the very special episode dealing with the character death, the character is almost never spoken of again. Seeing how Arrow has immediately taken Sara's death and placed it in the forefront for at least the first portion of the season, I don't think this is something we will have to worry about. A common slight against genre shows is that the bells and whistles of the genre setting or source can take over, leaving the characters to suffer (see The Walking Dead for a good example of this). But the pacing and character focus within "Sara" allows us to see how each of these individual characters is processing their loss. Predictably, Laurel begins to lose it immediately (and, for once, I really can't fault her for reacting in such a scattered and confused manner). Katie Cassidy, as I mentioned in last week's review, is one of the show's weakest links, but I have to admit I was impressed with her handling of Laurel's "interrogation" in the hospital. Seeing the rage and (finally) purpose in Laurel's eyes gives me a great deal of hope that Cassidy will be able to handle Laurel's upcoming transformation (or, at least hope that it will be far more engaging than Laurel's descent into alcoholism, a storyline that would have been a complete mess were it not for the abilities of Paul Blackthorne). 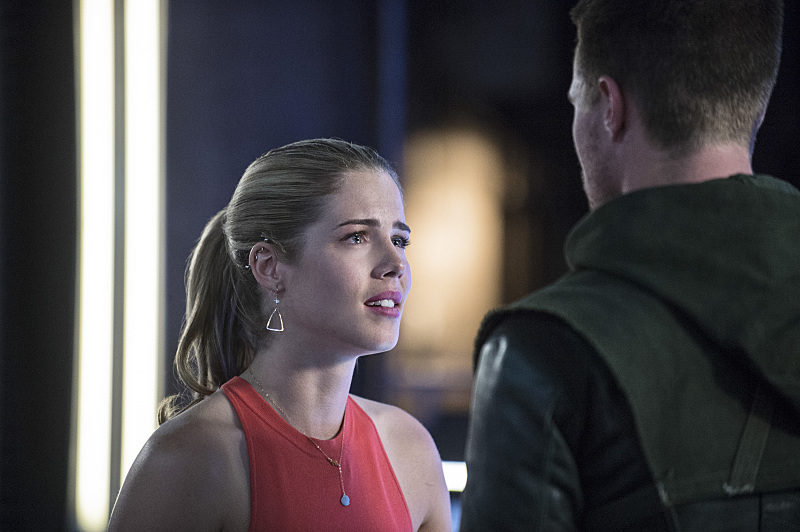 Felicity, the heart and soul of the Arrow team, has a much stronger reaction to Sara's death than I thought she would. I guess Sara and Felicity bonded far more than we saw during Sara's time in Starling City? 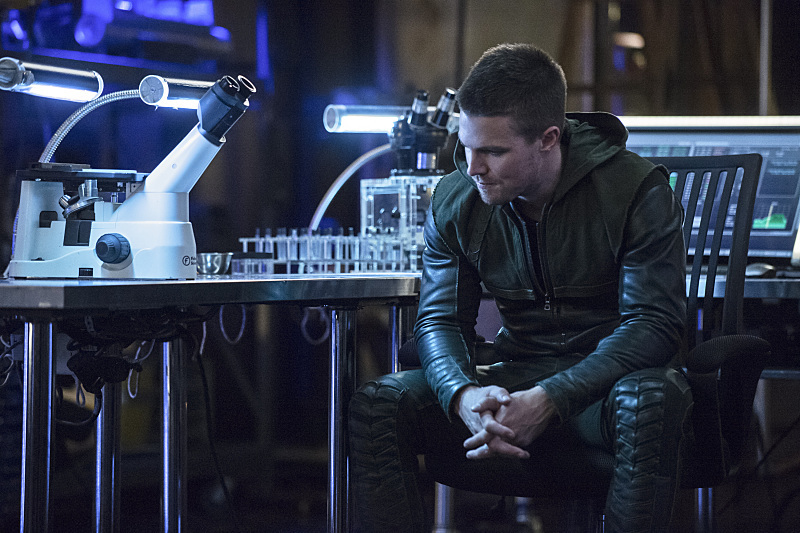 As is almost always the case, Emily Bett Rickards serves as the episode's MVP. Her emotional range throughout the episode was stellar and believable (not an easy feat to accomplish). My one worry with the Felicity story trajectory is that her positioning with Ray Palmer (Brandon Routh has been pretty darn excellent so far- I'm almost hoping that Palmer doesn't become an antagonist) will lead to Felicity falling into the Laurel-trap of being the damsel in distress. I have enough faith in the writers (and their clear love of Felicity) to believe this won't happen, but it is still a worry (especially since Felicity is going to be the only character on the show without any real fight training pretty soon). The one reaction to Sara's death that I didn't really buy was Oliver's. Sure, I totally believe that he thinks he needs to be the rock that holds everyone together (Oliver definitely comes for the Christopher Nolan School of Superhero, where he must continually suffer to save everyone). But there weren't enough cracks in his armor for my liking. 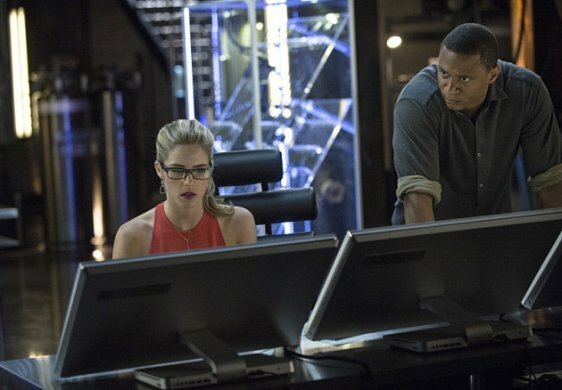 He nearly broke down with Diggle, but I'm completely with Felicity in her assessment of his lack of emotion. 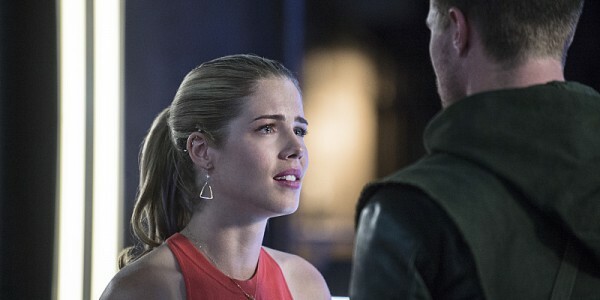 I will be able to accept this choice the writers have made if we continually see how this stoic act is leading Oliver to slowly self destruct, but I worry we might not get to that point. Which brings us to the real crux of the episode. Beyond the focus on characters and how the death of Sara has impacted them, the mystery of who actually killed Sara remains. Considering that Sara knew her killer, I'm pretty confident that no one watching "Sara" believed for a second that the villain of the week was responsible. Personally, I can only come up with four options as to who might have dealt the killing shot. As for the potential assassins, I've narrowed the options down to Nyssa al Ghul (which would be particularly sadistic on the part of the writers), Malcolm Merlyn (which strikes me as a bit too obvious), Thea (who knows, maybe Daddy has taught her to be a champion archer as well? ), or, the heretofore unseen Ra's al Ghul (which would suitably introduce him as our supervillain). While all are certainly possibilities, I'm really hoping it's Ra's. So far, Arrow is off to an excellent start. The episodes have been crisp and have done an excellent job setting up arcs for all of our characters. The only thing that could really make things better would be to have more complex and interesting weekly villains, but I have a sneaking suspicion that as the overall arc for the season begins to appear this quibble will disappear. Things, as always, will get worse for our heroes before they get better, but I'm excited to keep traveling down the winding path. Final Thoughts -- It was great to see Tommy again. Near the end of his time on the show, he really devolved into a truly unlikeable character, so it was nice to see him back as the genial, happy Tommy we were initially introduced to. -- As with the raging Laurel in the hospital, seeing Thea embracing the darkness and anger inside of her made me like the character more than I've liked her throughout the entire run of the series. Teaming her up with Malcolm certainly appears to have been the correct action on the part of the writers. -- Ray Palmer is so darn charismatic so far, although with a hint on instability. Excellent work by Brandon Routh.